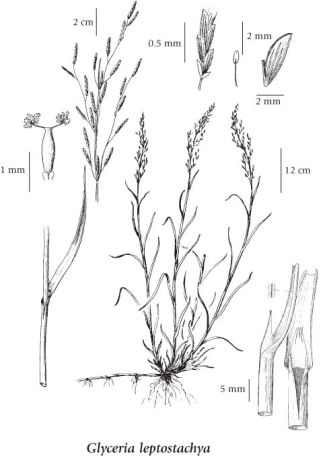 Perennial grass from rhizomes; stems erect to decumbent, hollow, up to 60-100 (150) cm tall/long. Sheaths somewhat flattened, finely rough, closed for most of their length but open for 1 cm or more; blades 3-7 mm wide, flat or somewhat in-rolled when dry, minutely rough on both surfaces; ligules pointed, the margins irregularly jagged, more or less finely hairy to rough, 6-11 mm long. Inflorescence a loose panicle, up to 40 cm long, the few branches ascending to appressed; spikelets loosely 8- to 13- (15-) flowered, narrow, linear, nearly circular in cross-section, tapered to the tips, 12-18 mm long; glumes membranous, the lower ones 1.2-1.5 mm long, the upper ones nearly twice as long; lemmas prominently 7-nerved to the narrow, translucent upper margins, minutely rough between distinctly rough nerves, slightly over 3 mm long, the lowest ones 3-4 mm long; stamens 3; anthers slightly over 0.5 mm long. Brackish tidal marshes, swamps, lakeshores, streamsides and wet meadows in the lowland zone; rare in coastal BC; N to SE AK and S to CA.